PA cabinet leader says EU should pressure Israel to stop deducting funds from the tax revenues it collects on behalf of the PA.
Palestinian Authority (PA) cabinet leader Rami Hamdallah on Thursday called on the international community, particularly the European Union (EU), to pressure Israel to stop deducting funds from the tax revenues it collects on behalf of the PA, the Ma’an news agency reported. 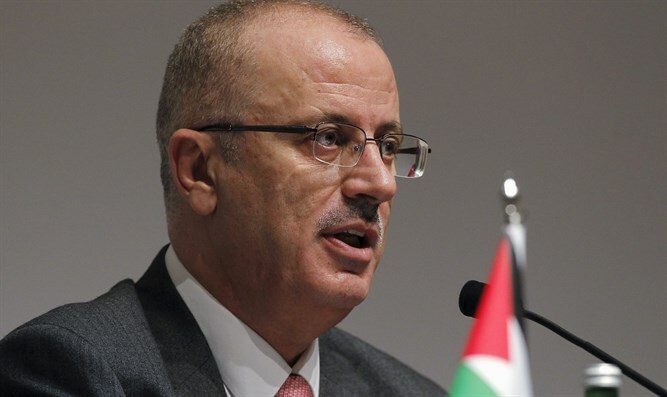 On Wednesday Hamdallah confirmed the PA had returned the tax revenues to Israel after it deducted 41 million shekels from them. Hamdallah also told the EU representative at Thursday’s meeting that it is necessary for the EU to recognize “Palestine” as a state and to push the peace process forward as demanded by Abbas at the Arab-European Summit recently held in the Egyptian city of Sharm el-Sheikh. Hamdallah also praised the ongoing European support for “Palestine” and said that even though many countries have reduced or stopped their aid to “Palestine”, the EU’s support has increased both financially and politically.